Rugs are an important part of your home decor, offering warmth, comfort, texture, color and pattern to your space. An area rug can be that finishing touch that makes your house feel like a home. 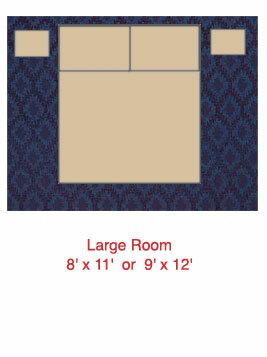 But deciding what size is best for your space can be confusing. 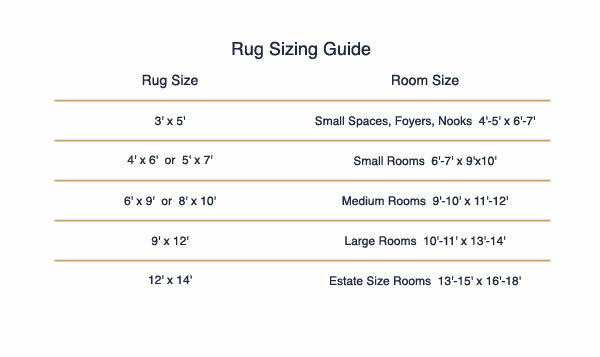 Here we give you some guidelines that will make your rug shopping easier. 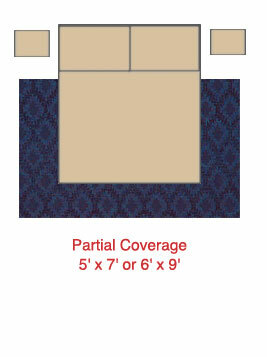 One way to choose your rug is to look at the size of your room. In general, leave at least one or two feet between edge of the rug and the wall so that it looks purposefully placed and not like you were unsuccessfully trying to create wall-to-wall carpeting. While looking at the size of the room can be a great place to start, sometimes it is more helpful to look at the function of your room and which furnishings you have there to determine rug size and shape. In the bedroom, as long as budget is not an issue opt for an extremely luxurious feel and go with a large scale rug that the bed and night stands fit on completely. 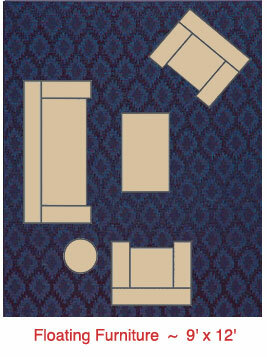 Rugs that are 8’ x 11’ or 9’ x 12’ work well for this design. If you are watching your budget, there are other options that can save you a lot of money and still have a polished look that will keep your feet warm when you get out of bed in the morning. 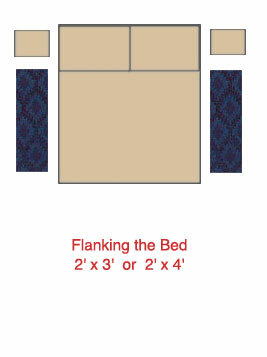 For a rug that fits partially under the bed, but not all the way to the wall 5’x 7’ or 6’ x’ 9’ will do. And the least expensive option would be two matching small rugs or runners flanking either side of the bed at 2’ x 3’ or 2’ x 4’. In the dining room, you want the rug to be large enough for the table and chairs to fit comfortably within and leave extra space for movement. 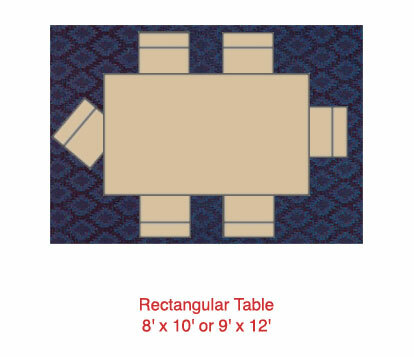 Go as large as your room and budget can accommodate, with standard sizes 8’ x 10’ or 9’ x 12’ for a rectangular table. 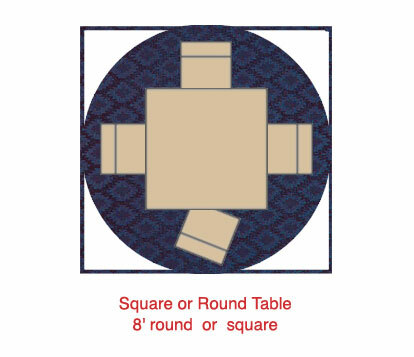 And 8’ round or 8’ x 8’ square for around or square table. If your living room has the space to float your furniture away from the wall, it is ideal to create an island that completely encloses your living room set. This works well for breaking up great rooms into multiple seating areas. Typically a large area rug 9’ x 12’ will give you the space you need to fit the entirety of your sofa, chairs, loveseats and living room tables on the rug. For living rooms that have less space, a popular alternative is to put just the front legs of each ofthe seating pieces on the rug. Rugs in the range of 6’x 9’ or 8’ x 10’ are roomy enough to accommodate this configuration and will leave you that foot or two of open flooring between the rug and the walls that help your room look balanced. 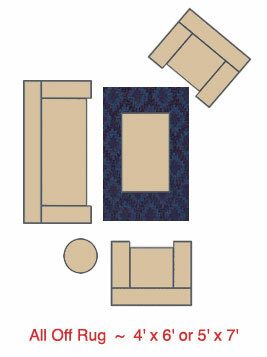 Some people prefer to use a small area rug that just fits the center of the seating area. This configuration won’t have any of the legs of the seating furniture on the rug, but it could possibly have a coffee table centered on it. 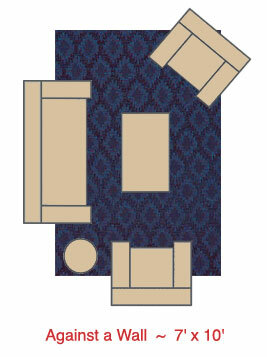 Small area rugs 4’ x 6’ or 5’ x 7’ work well for this. For more ideas on how to pick the perfect rug for your space check out our rug guide, tips for finding the perfect rug and our trend watch that tracks new style trends in area rugs.